Mecanizados Villarreal is involved in the creation of an advanced fire-fighting emergency system in railway tunnels. A team of researchers from the Institute of Transport and Territory from the Polytechnic University of Valencia (ITT-UPV), in collaboration with the Bank of Infrastructure of the Generalitat Valenciana (EIGE) and a business consortium where MECANIZADOS VILLARREAL, is included, have developed a new system of emergency management to act in case of a fire in a railway tunnel and facilitates the evacuation of passengers and crew. The system, designed under the Firetunnel project - funded by the Center for Industrial Technological Development (CDTI, public company under the Ministry of Economy and Competitiveness promotes innovation and technological development of Spanish companies) - combines the operation of four subsystems, for which the participation of companies specialized in different sector has been necessary, such as: Talent Engineering, Facilities and Services; Zitron; Euroconsult Group; Mecanizados Vila-Real; Postigo Works and Services and BONDITEX. Teresa Real, ITT-UPV researcher, states that "the work we have developed will improve the effectiveness of emergency plans, facilitating the work of the service staff and helping to reduce the number of victims, due to more effective evacuations" . 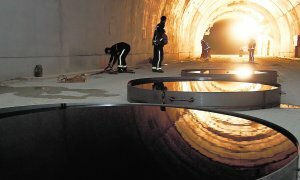 The first of the subsystems in the project developed to detect the existence and position of the fire in the entire length of the tunnel. Once detected, sends corresponding subsystems of anti-propagation, ventilation and information, in order to secure evacuation orders. Once the information of the fire position as been sent, the anti-propagation subsystem is activated, consisting on the deployment of fire-proof fabrics on both sides of the fire to prevent the spread of it, while leaving a gap in the zone is activated superior to allow smoke evacuation in a controlled manner in the upper layers and thus prevent it from mixing with clean air from the lower layers. At this point, according to Real, ventilation of the subsystem is critical, which allows to control the fumes exit: "This system has been designed to evacuate as fast as possible before the fumes cool down and get mixed with clean air" . Finally, the fourth is the information subsystem composed of variable message panels, depending on the location of the fire detected it will indicate the faster and safer evacuation routes. Once tested in the laboratory all subsystems, on January 15th a fire drill was held in the tunnel of Serra Grossa (Alicante), where it was found the behavior of smoke, the expected temperatures distribution and the proper functioning of the global system. The Department of Safety of the City of Alicante participated in the coordination and management of the actual test of Firetunnel project through its Technical Department of Civil Protection and Emergency Management, considering how it should perform this actual testing and providing technical advice to run it.The Department of Prevention and Fire Fighting and Rescue of the City of Alicante (SPEIS) participated moving there two crews and a dozen firefighters, corporals and commands. The intervention was carried out from two aspects from the point of view of safety. On the one hand, outbreaks of fire in terms of the provisions of the protocol were monitored. Furthermore, the temperature of the fire was monitored with several lines of water and foam, while maintaining appropriate levels to successfully perform the test with maximum safety. This intervention worked for the SPEIS firefighters as a practical exercise of a possible intervention with real fire in a tunnel, where there are established evacuation measures, sectorization fire and smoke, as well as a vent subsystem that provides the right conditions for evacuation of smoke and gases generated. Just as planned, the duration of exercise with fire lasted approximately 15 minutes, after which the firefighters SPEIS extinguished the fire and proceeded to evacuate the entire smoke, fully securing the area that was completely cleaned once completed the proof. The drill also included the participation of the Provincial Fire Consortium with funding support, in addition to effective Local Police Corps of Alicante. 11 sql / 3 sqlseo / 0.05646515s.